USING WASP FREEZ FOR MUD DAUBERS IS MESSY! 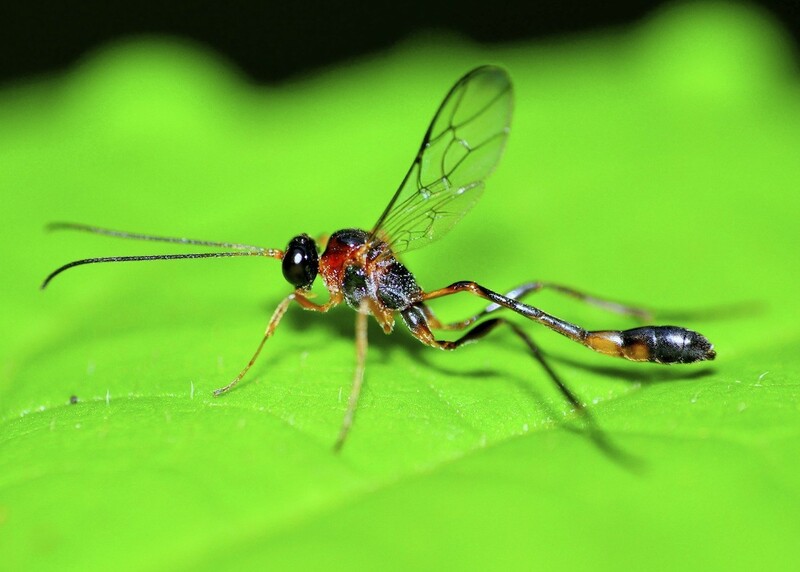 Mud daubers are a species of wasp found throughout all of the United States. There are many species found in urban areas all of which are likely to nest on your home. Included on this list is the organ pipe, the black and yellow, the blue, the potter wasp and the mason species. These wasps are so categorized because they create larva rearing mud tubes where young wasps will hatch and develop. Typically you’ll find their nests on the sides of your home but they can choose many locations to build them like boats, electric panels and even cars. Mud daubers like to construct nests between brick in mortar joints, where wood trim facia boards and molding meet and around window and door frames. Though they all seem to be the same type of nest, in fact each species has distinct characteristics associated with design patterns of the mud. The easiest to identify is the organ pipe whose nests are long and resemble the way the pipes of an organ sit. Black and yellow daubers build their nests more on top of each other and the other species are different still. Regardless of the way these nests are constructed, mud daubers frighten many people and have been mistaken for termites on too many occasions. Most mud daubers feed on spiders. Females seek out spiders, sting them and deposit their bodies in the back of a larva cell of their nest. An egg is then laid on the spider for the young so when it hatches, it will have plenty of food on which to feed. A female will typically have several eggs in a single “pipe” and will have 3-6 pipes per nest. If conditions allow, she may have more than one nest. Its not just coincidence that nests seem to prevail on certain homes. It appears to be homes which are stucco, brick or other porous, rough surfaces which this wasp definitely seems to like. No doubt its both easier to build nests on such surfaces as well as the fact that nests seem to “hold together” better on them too. This lends credence to the theory that daubers generated from nests built on such surfaces are more likely to use an identical surface for their own reproductive egg laying. Most definitely. But they’re not as likely to sting as other species. 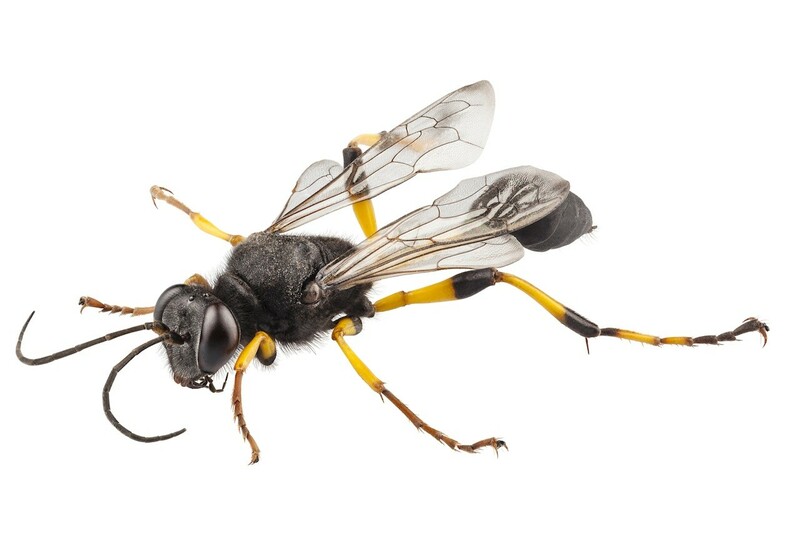 Mud daubers generally use their stinger for food and will not sting unless provoked. The rule here is simple; avoid handling them and don’t put your hand by their nests and you should avoid getting stung. That being said, you don’t want to let them build nests on your boat, home, deck, patio, etc. where you want to spend time relaxing! Like most wasps, mud daubers don’t like CYPERMETHRIN. This product is both easy to use and works great at controlling local infestations. Your method of treatment will vary on the time of the year you are treating. If it is spring and they have just begun nest making, simply spray the Cypermethrin on the sides of the home where there is activity. Use 1 oz per gallon of water and use 1 gallon per 500 sq/ft of surface area. Treatments should repel them from the area; nests directly treated will die off within a few days. For most treatments, simple PUMP SPRAYER is all you need to apply the solution. If you have heights of 15 feet or more, use a HOSE END SPRAYER to make the application. Using the power of your garden hose, you can generally treat any home in very little time and reach 20-25 feet up which can be helpful. No doubt the hose end sprayer is easy to use. But it will use more product to do the job compared to the pump sprayer. On the flip side, the pump sprayer may not be able to reach quite high enough so you may need both pieces of equipment. Which ever you use, try to get about 500 sq/ft of coverage per gallon of material used. And remember that most homes will need 2-4 gallons to get adequate protection. Although you may only see activity on one side of the home, try to treat as many sides as you can. This will prevent them from simply moving to the untreated side of your house instead of moving off your property completely. Expect to make applications about once a month throughout the spring and then a few more during the year. Cypermethrin works well on mud daubers and treatments will both kill and repel them from the area. Its also good for use on plants and other areas in the yard where unwanted wasps might be active. For 1-2 nests, WASP FREEZE can be used. But keep in mind it uses a heavy oil which can stain most any finish. And treatments won’t last. So for most mud dauber problems, wasp freeze is not a good option. And since the overspray can suffocate any kind of ground cover or flower, you must be careful when using it in the yard too. Since mud daubers will routinely nest in hidden spaces like under decks or in cracks or crevices, the liquid Cypermethrin is not always the best option. It just doesn’t penetrate these spaces well and since any wasp will sense its presence, they’ll avoid the treatment. This will allow them to relocate and build nests where you missed with the spray. Furthermore, mud daubers like to nest on cars or boats and once they get “scented” with mud dauber pheromones, more will be coming around throughout the wasp season. Fortunately there is an active that works as a “non repellent”. Known as PHANTOM AEROSOL, this active won’t be noticed by mud daubers or any other insect. They’ll readily walk over the treatment and in turn, pick up a lethal dose. It will take a good 2-3 days to kill them but this is by design and normal. The good news is they won’t know its there which insures they pick up a lethal dose and die. Phantom can be sprayed on boats without hurting the deck and its ideal for use in the cracks and gaps found on decks, brick work, etc. Use it every 2 weeks when they’re active and remember a little goes a long way. Within a week of spraying with cypermethrin, mud daubers will be gone. To keep them away all summer, spray once every 1-2 months during the warm season. For a more “permanent” solution, add some NBS REPELLENT to your paint or stain the next time you apply any to your homes siding. 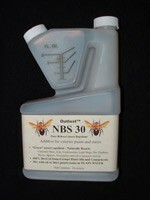 NBS uses essential plant oils and will readily repel wasps for up to a year or more when used as an additive. You can also spray NBS to repel mud daubers but keep in mind its not an insecticide so it won’t kill any already active. But it does a good job of keeping them away and can be used on plants, etc. where wasps are unwanted. Mix 3 oz per gallon of water and spray the mixture over 500 sq/ft of surface area for up to 4 weeks of repellent action. Renew monthly to keep them away for good. Mud daubers are persistent once they identify your home as a place they like to nest. But if you’re able to treat early in the spring, you can expect 1-3 treatments to keep your home dauber free for the season. If you have a big infestation, it will require removing active nests and spraying over as much of the home as possible. This will insure they don’t simply move over to untreated areas. Mud daubers like to build nests in our boat’s folded sails. When we’ve finished sailing we flake the mainsail onto the boom and cover it with a canvas “jacket”. When we return a week later and hoist the sail we often find that mud daubers crept in under the jacket and built nests within the folds of the sail. We need a repellant but we’re reluctant to use any chemical spray or oil that might discolor our sails, or any solid device that could emit fumes under the hot jacket….for the same reason. Any ideas? Is the Waspinator effective against mud daubers? I don’t think the Waspinator will help in this case because mud daubers do not appear to be “territorial”. Additionally, the Waspinator mimics a different species altogether and one daubers do not fear. Lastly, people who’ve tried using one for mud daubers have not gotten any positive results so I can’t recommend it. What I do know is that I keep a boat on a local lake and fight with Mud Daubers who nest just under the canvas covers I use to cover my boat. The boat is 25′ long with two large covers and daubers will target any edge. Their nests have been an ongoing issue for many years nesting just under the cover and in the folds and seams of the canvas. They also enter air vents to my hull and motor compartment where they build messy mud nests that have caused motor issues in the past. To deal with the problem, I started applying Phantom Aerosol to any surface they want to use. This aerosol is unique in that it goes on “dry”, is odorless and after using it for more than a year, has not discolored or affected the canvas (black) or the boat decking in any way. Even when freshly applied it does not make the surface “wet” or leave any visible residue. I now “mist” into all the exhaust vents as well as the canvas edging and this has proven to work well at stopping them. I also use Phantom throughout my home for various pests because I have hardwood floors and cannot spray any kind of liquid without making a mess. Phantom goes on without leaving any sign it’s there so in my opinion, this would be your best bet. One other thing; Phantom doesn’t work fast like most insecticides. It will take a good 2-3 days to have any kind of impact on targeted insects so don’t expect to see wasps dead just after treating. What I find happens is that one week after I treat, all the activity around my boat ceases. And if I treat once a month, it seems to keep them away for the season. We bought a can of Phantom and have used it successfully all season…..after each sail we’d spray all edges of the sail cover and also the end access points, including the sail’s luff. Only one mud dauber found its way under our sail cover and that was likely due to: 1) inattention (3 weeks lapse) on our part, and 2) not thinking that a prolonged rain might diminish some of Phantom’s effectiveness. A quick weekly spray does the job and we’ve gone 2 weeks between sprays without any bug access. Great to hear! I use Phantom all the time on my boat (no sails but lots of holes for them to access) and I wish I was as persistent as you! My New Year’s resolution will be to make sure I get an application done once every two weeks. My current spray routine (once a month) holds off the mud daubers fine but not the spiders. I think I’ll ramp up my efforts in 2013 to once every 2 weeks and I bet that will do the trick. Again, good to hear you’ve been wasp free and happy sailing in 2013! I have mud daubers making nests in the ground. They leave holes where they enter and exit. I have at least 30 holes and because they are so active I can’t weed or even walk close to where they are. They’re are on the south side of the house so it is all day sun. Help! Thanks. I suspect you have either Digger Wasps or Cicada Killers. 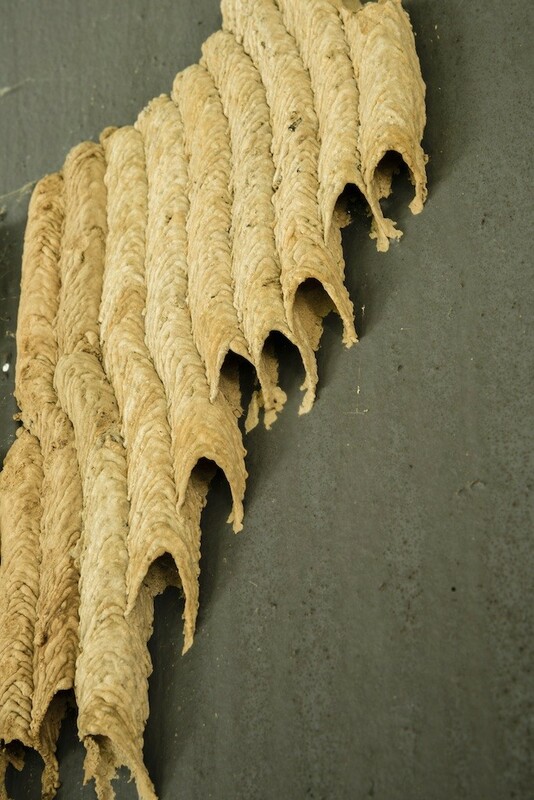 As explained in our article above, Mud Daubers build their nests on the side of structures and not in the ground. Regardless of which wasp it turns out to be, if you want them gone you’ll need to drench their nests with Cypermethrin. Use 1/4 to 1/2 gallon of mixed solution per nest. And mix the Cypermethrin up at 1 oz per gallon of water. @Tech Support: Good information! I have these holes all along the edge of my pond, sometimes going down to the water level and causing the ground to sink in spots. I’ve been filling the holes with Sakrete and filling in the last couple of inches with dirt. I can imagine an archeologist digging up my yard in 200 years and wondering about the meaning of those concrete pillars! We have blue mud daubers around the casing of our in ground pool at two corners and we can’t seem to get rid of them. We killed one and compared it to make sure that they are indeed blue mud daubers we need them gone because of allergies and little kids. Please help!!!!! Treating with the Cypermethrin mentioned above would work fine if you’re able to do the treatment without getting the spray into the pool water. But a better option would be to dust the crack and void with some Deltamethrin Dust using a Hand Duster. This would be easy to do, kill any dauber nests immediately and last a good month or two. Plus any dust that drifts into the water would be rendered harmless because all you need is water to clean it up. We live in the country and the wasps are building nests in every can light in our covered decks. I can remove the light bulb, but you have to stick your hand inside to remove the baffle which I don’t want to do. Any type of spray I can use without damaging the light components? We have a unique aerosol that will handle this problem. Phantom is both odorless and fine to use around electrical components. When used properly, it will go on “dry”. In fact I have problems with both spiders and mud daubers on my boat. The daubers like to enter exhaust vents and build nests inside the motor compartment. Spiders like building nests all over the decking of the boat. But by treating these areas every 2-3 weeks during the spring, summer and fall, I’ve been able to effectively stop this behavior for good. And since the Phantom is odorless and goes on dry, you can’t even tell anything been applied to the boat. For cosmetic reasons, this is important. Additionally, since my engine compartment has a lot of electrical components, I have to be careful what I use there. The good news is that after a few years of using the Phantom on the wiring, I know it’s not done any damage or had any impact other than eliminating the pest problem I was treating so I know it will work for you too. Basically all you need to do is direct the spray alongside the light bulb, without having to remove it, and give a one second blast to 2-3 sides of the bulb which will completely treat the can. This should effectively cover the area and though you won’t see immediate results, the treatment will kill anything that touches the treated surface in 1-2 days. So with daubers, I find by 3 days after the treatment, they’re all dead. Retreat during the warm summer months twice a month and you’ll be able to solve this problem for good. Will it kill what is in the mud (nest) also, or do I have to knock down the nest? Nothing can kill developing pupae so if there are any deep inside the mud nest, no, they’ll still be alive. But if the nest is new, like two weeks or less in development, there won’t be any eggs laid just yet. That being said, what I always suggest is to treat with the Phantom, wait 3 days for it to kick in and then knock down any nest you can find. In theory, no new nests should ever develop after you knock down the old nests if you wait at least 3 days and follow the recommended schedule. I have hundreds of nests up in my attic; just discovered them. They seem dormant at the moment. Should I knock them down and get rid of them or leave them? If you have access, I would remove them. This can generally be done with any kind of scraper. Since mud daubers will be over wintering and ready to hatch out this spring, removing them now will help reduce problems for you this spring and summer. Next, I’d either dust or spray all the exposed wood with Drione (dust) or Bifen (spray). The Drione would be the longest lasting solution. Albeit the treatment will be a bit more tedious to make but one dusting a year is all you’d need to do and for me, because Drione works so well it’s well worth the time and effort to get it applied. Alternatively, if you wanted to spray something, the Bifen can last 2-3 months and would be easier to apply. However, you’ll need to treat at least 3 times per season to keep them out of this space all year. Lastly, I’d try to isolate how they’re getting into this space. My bet is you have an attic vent with screening that’s not quite “tight” enough. Inspect any vents to your attic and if you find screening that’s too wide, missing or damaged, add a tighter mess screen to help sure it up and keep the daubers out. In the end, blocking their way into this space can be an effective strategy for sure. We have a 20′ porch ceiling and mud daubers like to nest on the high walls back there. Can Cypermethrin be used in a power washer….it’s the only thing that will reach that height. And if so what about blowback spray…is it harmful to humans? As a general rule, it’s very wasteful to spray any insecticide that high onto an inverted surface because most of the material you apply will simply drip off. But can it be applied this way? Yes. And if you equip yourself with some rubber gloves, a face shield and a protective suit, you could proceed without getting any of the mixed product on the person doing the application. Alternatively, using a paint brush or a paint roller at the end of a long extension pole would prove to be a lot more effective resulting in very little chemical waste. No doubt it will take longer to apply but in the end, you’ll only need to use 1 gallon of mixed solution per 500 sq/ft. 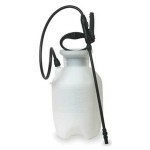 Now if you choose to spray, expect to use 3-4 times as much of the Cypermethrin since most of it will be dripping off. For this reason the “efficiency factor” can be big dollar wise. Lastly, we also have many people using a misting machine to “mist” such areas. This is by far the most effective way to cover the area and as long as you can get within 15 feet of the surfaces you want reach, the misting machines will blanket the surface evenly. Using this method, you can get adequate coverage for the same 500 sq/ft in just 30-60 seconds. And you’ll be using a lot less material. Maybe just 16-32 oz of mixed solution compared to 1 gallon or more when spraying and most of it is dripping away. No doubt the machine needed is an investment but since it will last for many years, it will effectively pay for itself in chemical cost savings and since it can be used in the yard for mosquitoes, gnats and other biting pests, a device that can be put to use for sure. One last note; for areas like ceilings, you’ll find Onslaught to be a better product over the Cypermethrin. This is because it will last 6-12 months per treatment and for exterior ceilings, it’s the way to go if you don’t feel like spraying every month or two. I use it for my front porch ceiling which is only 10 feet hight and I actually paint it on. I go through around 1 gallon since I’ve got a large bead board ceiling up there but the treatment takes care of daubers, spiders and moths we so it’s well worth the time doing the treatment. Great info, thanks! Can the Onslaught also be used in and around boats without staining or discoloring the covers? It can. But as a boat owner myself, I’m not sure liquid sprays are your best bet. Now if you’ve got a cabin cruiser that has a lot of carpeting, using a liquid is fine. But I have a deck boat with lots of high glossy finishes so a liquid isn’t the best for these areas. And for my covers – especially where my bimini top zippers onto the metal frame that holds it in place – I use an aerosol called Phantom. Phantom is odorless and goes on “dry”. A light misting to all the edges of my three covers is all I need to do every 2-3 weeks and it stops mud daubers as well as spiders. I get tons of spider webs on my boat along with the daubers but the Phantom keeps both under control. I use it for all the air vents found on the boat too since the daubers love going in these to nest. I’m talking about the engine exhaust ports and air vents as well as around the engine covers and basically, any door frame. You may want to give the Phantom a shot; it’s handy, easy to use and is ideally suited for use at the dock and boat. This is our second summer in our home, which is a log home. Already the mud daubers are out of control. Most of the advice I’ve seen on getting rid of them entails destroying the nests. The problem is I can’t find them. I’ve found a few in boxes in the garage and destroyed them but that’s not even where we have the wasp problem. They swarm the outside walls of the house. They’re always there but I never see any nests on the walls out the house. To make things worse, somehow they get inside. We don’t even open our windows. We run the ac instead hoping that that will prevent them from getting inside but it doesn’t help. The house is brand new and so the windows are in perfect condition and the screens fit perfectly and tightly. Still they’ll be in between the screen and the window. Just now one flew out of the upstairs bedroom and he seemed to come from nowhere. I can hear them buzzing around through the beams in the upstairs bedroom. It’s almost as if they are inside the walls looking for a way out and then eventually get out into the house. I feel helpless. Do you think it’s possible that they have bested in the walls of our home? What should I do? I have seen mud daubers do this on old brick homes, cedar homes and log homes. Basically any home that has a lot of cracks and gaps is prime real estate and certain bees and wasps will take advantage of these spaces to create areas to nest. Now on most homes, the nests will be on the outside of the structure. And to treat these nests is fairly easy. Scrap them down and spray with some Cypermethrin to repel the wasps and prevent new nests from forming. But how do you handle a situation like you have where nests which are mostly hidden? The answer is to use a dust. In fact, Drione Dust is a great product for treating log homes for all kinds of pests. When applied to cracks and crevices, the Drione will drift around in the hidden space and lightly cover the areas where mud daubers move and traverse. And when they come in contact with the dust, they’ll meet certain demise. Apply the Drione with a Hand Duster if you can reach around all the windows, soffits, vents, door frames, etc. where they’re likely entering your wall voids. But if the home is a two story structure, a Dustick will prove to be quite helpful. Now once you’ve dusted every crack you can find, let the treatment sit a day. During this time the dust will be killing any wasps that come in contact with the dust and if you treat the majority of the entry ways they’re using, most will die within 1-2 days. And over the next few days, most activity will cease. On the day after you dust, you need to spray the siding of the home with Cypermethrin. This product will both repel and kill any that you miss with the dust and should be applied every 2-4 weeks to insure more don’t come around to start new nests. One more product worth mentioning is NBS Stain Additive. This product can be added to any type of stain you use for the logs which will enable the stain to act as an insect repellent. 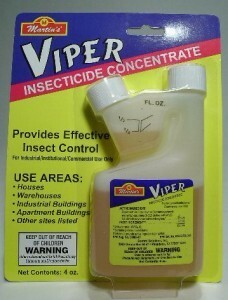 It works great on wasps, carpenter bees, etc. and will last a year or more which will also reduce the amount of spraying with Cypermethrin you’ll have to do during the warm seasons. We have a very large workshop which is overrun with wasps, dirt dobbers and some type of large roach. We can’t enter our garage. We had an infestation of spiders before the wasps and then dirt dobbers moved in. We need a permanent solution. We use the garage for storage, boat, etc. We can spray, apply powder, or whatever and wanted to also know if there was a stinging light we could use as prevention. Please help. This is an easy one. First, remove as many of the spider webs as you can. If you can’t reach them all, get a Web Remover. They’re well worth the investment. 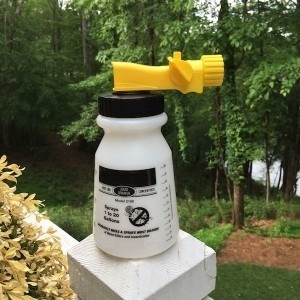 Second, mix up Cypermethrin at 1 oz per gallon of water and fan spray it over the exterior siding, all the windows, under soffits and around the doorways to the garage and workshop. Cypermethrin will provide instant knockdown and control of wasps, spiders and roaches. Use a good pump sprayer to make this application. Next, apply Phantom aerosol to any cracks, voids and spaces where you suspect any of these pests might be hiding. This can be done outside but also inside the workshop and garage. Phantom is odorless, lasts a month when applied inside and goes on “dry” so it won’t make a mess. Just understand that its not a quick killing agent; in fact it will take 2-3 days to kill target insects but this is by design. Once it kicks in, target pests won’t stand a chance. If you follow these directions, you should be insect free within a week and if you treat monthly with the Cypermethrin after the problem is solved, you should be able to keep these pests under control. We have a two story boat dock. The biggest problem is wasps of some kind. They crawl down into the cracks on the top deck. The top deck is wood on top and has metal underneath. Do you think they have nests in between the wood and metal? The space is about six inches in height and 32 x 32 feet (length and width). If so, is there a way to treat the dock without damaging fish, etc. in the water? A secondary problem is spider webs. We knock them down and they are back within hours. You most likely have mud daubers nesting on the bottom side of the second level decking. I spend a lot of time on a local lake (Lake Lanier) know two level docks quite well. Over the years, I’ve seen your type of problem many times. The good news is you can easily treat and maintain these pests. In fact, I happen to keep a boat on Lanier under a covered dock. I mention this because it relates to your problem. My dock is only one level but the roof is metal and mud daubers love building nests above my boat. I also have a massive spider problem so it would appear that we have similar pest issues. Now a few years ago a product came out which I found to be perfect for both problems. Known as Phantom, this material is an aerosol that goes on “dry”, has no odor and insects won’t notice its been applied. This makes it perfect for use on boats and boat docks. So for my boat, I’m able to lightly mist the outer most edge of the decking (where the spiders like to web) without making a mess. My boat is a deck boat and it tends to get webs under the railing, around and under the Bimini top as well as my fishing rod holders. But when I lightly mist these areas 2-3 a month during the spring, summer and fall, I can stop the spiders. I also get mud daubers entering my motor compartment through the air vents. To stop them from using my engine compartment, I simply treat with the Phantom into the vents. Lastly, I have the mud daubers and spiders making nests above my boat. Again, lightly misting the underside of the roof stops them completely and treatments up there will last a good month since it’s protected from the sun and rain. The spraying on the boat don’t last as long since I take the boat out into the sun, rain, etc. But underneath the roof, it’s protected so it can last a lot longer. So for your problem, the Phantom would definitely be the way to go. Its easy to use and if you were to treat every gap in the decking of the top level of the dock, you’ll be “fogging” the aerosol into the space underneath. This will enable the Phantom to get onto the bottom side of the wood and by doing so, stop the mud daubers from using this area. And since its the bottom side they’re no doubt targeting, treatments will last fairly long since they won’t be taking direct sunlight or rain. Now its important to understand that you’ll need to along every crack using the included straw tube injector that fits into the spray nozzle. Though this might sound difficult, it’s actually quite easy to do. And you only need to spray around 1 second per foot of crack so you will probably only use 1/4 to 1/2 of a can per treatment. Next, treat above the decking where spider webs accumulate. This can be done on both levels as well as on the boat if the spiders are active on board your vessel. Since Phantom goes on dry and is odorless, you only need to keep people and pets away when treating. But once applied and allowed to dry for 30-60 minutes, everyone can return to the area and use it as normal with no hazard or safety issue. Also, when used properly, there will be no risk or problem for the water and fish below. Remember, you don’t need to over apply. Just lightly misting is all that’s needed so the treatment will be staying on the deck when done properly. Now something you need to understand is that Phantom is very different from most any aerosol. As it’s name implies, insects don’t notice it so it’s like a “phantom” to them. This way they will readily walk over the treatment, bring some back to their nests and in doing so, contaminate their eggs, larvae, etc. This insures it gets all stages of the problem. But this also means the active is slow to work. So in most cases, insects won’t die for 2-3 days following a treatment. In other words, it’s not a “contact killer” so don’t spray bugs directly and expect to see them drop dead. This won’t happen. About two weeks ago (before my Drione dust shipment arrived) I noticed a carpenter bee flying around two small holes between the bricks in the side of my house. Now the holes are filled with mud which leads me to think it’s actually a mud dauber nest. I have the Drione now, but I want to know if I should poke a stick or something in the hole to break up the mud so I can dust? I just don’t want a swarm flying out at me if I do. Any suggestions? I live in Florida and have mud daubers all over my home and I’m getting ready to repaint the entire house. The painters will remove the nests when pressure washing the home prior to painting. Is there anything they can add to the paint itself which will help repel the mud daubers from re-nesting all around the home? Yes. Have them add NBS to the paint. It’s an all natural repellent that works great on wasps and bees to stop them from making new nests. I have a third floor apartment crash pad for when I’m on site at a job. The unit is a converted attic with lots of exposed brick and beams and basically the underside of the roof above me. I’ve noticed a few dauber nests that I have scraped off. Last week, I saw a single dauber crawling around the bathroom so I caught it and released it back outdoors. I know daubers aren’t very aggressive but as I am allergic to wasps, I’d rather not take the chance that one might have crawled into bed with me. Is cypermethrin okay to spray indoors? Would it be okay if I sprayed it before I left for the weekend? The Cypermethrin listed above can be used safely inside homes. But given the area you want to treat, I don’t think it would be the most efficient way to treat. I say that because the spray would no doubt drip off the surfaces you treat leading to a lot of waste. Combine this with the fact the treatment would only be good for 30-60 days means you would have to spray on a regular basis. So what could you use efficiently? There are two options. The first is the Phantom aerosol listed above. Its just about odorless, will go on dry and won’t make a mess. Any insect coming inside would not notice its present so they would readily absorb plenty of chemical to kill themselves. Treatments would only last 3-4 weeks so yeah, you’d have to use it throughout the season. But its probably a better “fit” all things considered. Lastly, what I would do and in my opinion would be the “best” fix would be to dust with Drione. This would require a bit more work to get all the cracks and crevices treated. But one treatment would last the whole year if not longer so in the long run, this approach would be very efficient. We have several daubers that keep coming back to the same locations around our back yard, around the pool area and bbq. No matter how many times we spray them with the basic bee spray more return. Any advice on how to permanently keep them away for the summer? You’ll need to treat with one of the options in our article above. If they’re landing on plants, the NBS or Cypermethrin are great repellents. If they’re landing on the BBQ, the Phantom would be better suited. Read about them above and let us know if you have further questions.